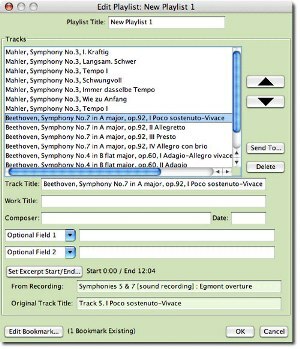 Playlists provide a way to combine track or excerpts from multiple recordings into a single list. Playlists are stored in data files on your computer. Students can download a playlist created by an instructor or create their own. Playlist bookmarks can be added and edited just like bookmarks in the audio player window. However, playlist bookmarks are stored in your playlist data file, not on the Variations server. You can have the audio pause after each track by selecting Pause after track in the Playlist window. This can be useful in a class if you only want to play one excerpt at a time. 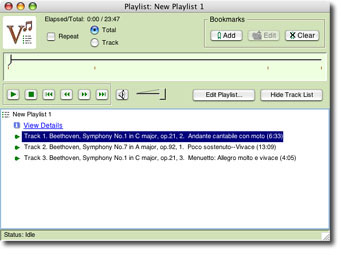 In the Variations player, right-click (Mac:command-click) on a track. Then select Send to Playlist. The track you select will be added to a playlist. If you do not already have a past playlist open, a new one will be created by default. To add multiple tracks, right-click (Mac: Control-Click) on the track grouping, CD/Side, or album in the player window (sometimes requires clicking twice) and select Send to Playlist. Currently, there is no easy way to select multiple tracks in the player window. If you don't want all the tracks from the album, CD/side, or grouping to be in your playlist, first add the album, CD/side, or grouping, and then use the Edit... button in the playlist window to delete unnecessary tracks. To start a listening drill, click the Listening Drill button on the playlist window. A window will open and you can select how you want to be tested. More information on listening drills is on the Listening Drill Page. Playlists can be modified after they are created. Click the Edit... button to open the editing window. The editing window lets you delete tracks, set start and stop times for tracks, reorder them, add comments, or add track data for use with the listening drill feature. You can create a new playlist from a subset of an existing playlist by first selecting the tracks you want to use for the new playlist and then clicking the "Send to..." button. This will open a new playlist and send the selected tracks to the new playlist. To use the new playlist, first close the editing window. Playlists can be saved to a file for later use or sharing with others. However, a playlist file cannot be opened unless the user has permission to access all items in the playlist (for access details, see the Media Access Help page).